Belts and Sashes, oh my! is right….What a defiant want to express your style then to add a simple to ornate bridal sash or belt to your already gorgeous bridal gown. Of course, we love to find all things handmade and simply unique or one of a kind. We found this amazing designer on one of our favorite sites, Etsy. 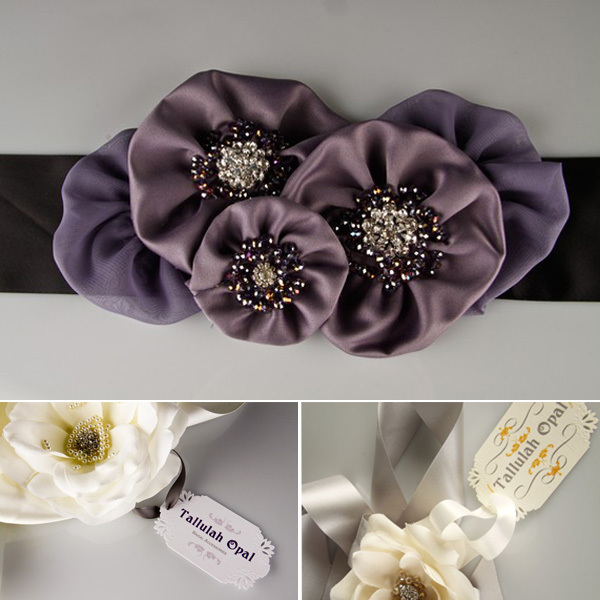 Tallulah Opal is a designer out of Kansas City who has some of the most beautiful wedding sashes that are constructed completely by hand. 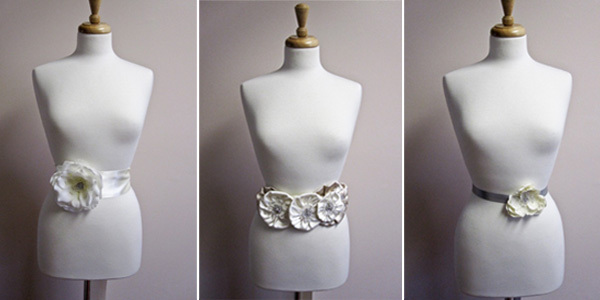 She uses classic materials such as silk ribbons, glass pearls and swarovski crystal beads. She also loves to find vintage pieces, such as rhinestone buttons and beads, to incorporate into her sashes as well. This makes her pieces truly unique. Don’t be afraid to add that little splash of color to your white day….maybe some classy pieces that incorporate purple, peach and silver tones. This can be that understated piece or be that one shining accessory that everyone comments about. Like we, at WedCandy, have said before – venture outside the box… you never know where it might lead you. Visit Tallulah Opal for some great pieces to compliment your already gorgeous frame.